Kids, elder and beginners friendly. Fun and safe for all ages. 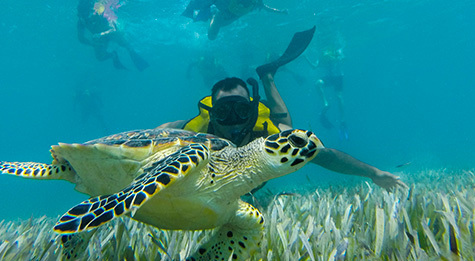 Swim with sea turtles in Cancun. 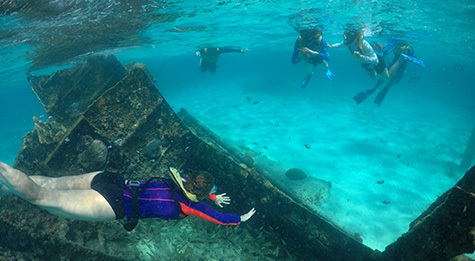 The only snorkel tour in Cancun over a Shipwreck! Individual attention. No waiting lines. Avoid crowds! 5 schedules daily. Come, amaze yourself and continue enjoying your stay in Cancun and Riviera Maya. So much to show, we couldn't keep it just for us! 12 hours before the selected schedule. Tickets subject to availability. 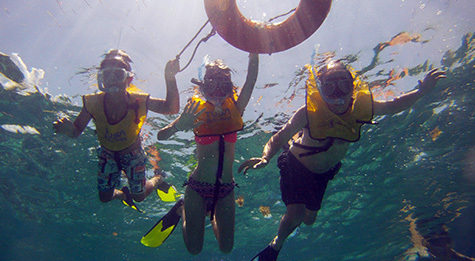 This is the best Cancun snorkeling tour, friendly with everyone even if you have little or no experience (non-swimmers and beginners are also welcome). 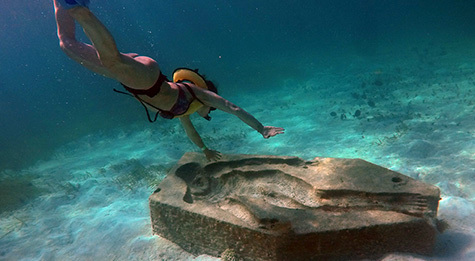 Get ready to remember this tour as a highlight during your Cancun and Riviera Maya vacations. 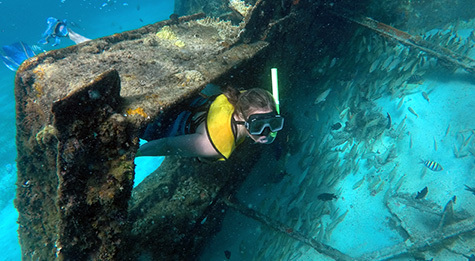 Swim with marine turtles, tons of colourful fishes, coral reef, and an amazing shipwreck. This snorkel tour is a 2 hours excursion where the whole area has a max depth of 9 feet, with calm waters and non or few current. Our marina is located less than a mile away from the reef, we get there in a short 5 minutes boat trip. 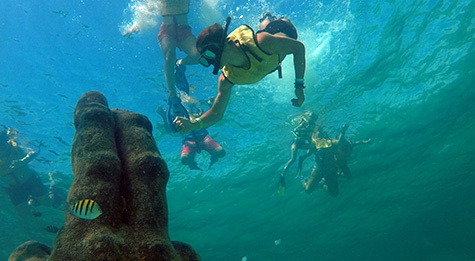 You’ll be snorkeling before you know it so forget about dizziness. Enjoyed at “El Meco” coral reef, one of the best-conserved spots in the Great Mayan Reef, full of fish and marine life with an 8-12 feet depth, warm water and few or non-sea currents. Plenty of coral and fish schools. You may enjoy the first turtle encounter in this area! Our 3rd stop os at "MUSA Underwater Museum" where we'll enjoy 2 submarine art galleries: "The blessings" and "Aquarium Family", art and environment interaction in the depths of the Caribbean Sea. Our spot to find ?sea ?turtles? in Cancun?, 96-98% chances to see from 1-5 turtles! We might also see and swim with rays. When was the last time you had the chance to swim with ?marine ?turtles on their natural habitat? We have saved the best for the last! 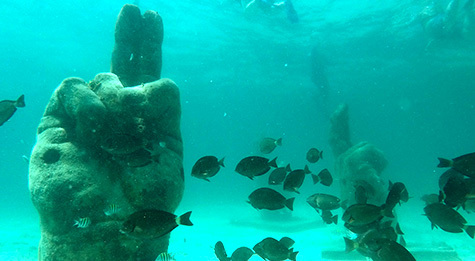 We will visit a shipwreck full of life, filled with colorful coral and many kinds of multicolored fish. The shipwreck is surrounded by crystal clear water and white sand, you’ll feel like you are swimming in a natural turquoise pool! Special attention for non-swimmers: We're experts turning your anxiety into joy. 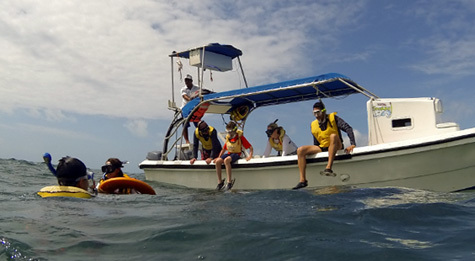 If you or a relative are beginners or non swimmers, you can still enjoy this snorkel adventure. A guide will stay on the side the whole time wearing a life preserver where the non-swimmer can hold from, personalized attention during briefing-lesson is offered, and of course a life jacket. "Extraction" service: In the unlikely case that you get dizzy, the marina is located less than 1 mile away from the reef, so we'll send a boat to take you to land within minutes! 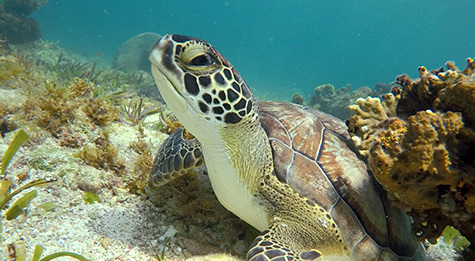 No need to spend a whole day to swim with turtles: There are some other few places to snorkel with turtles in Cancun and Riviera Maya. 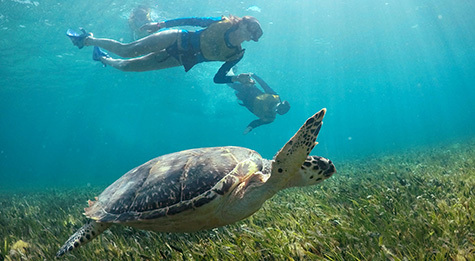 It's usual to swim with turtles in Akumal, however you spend more time in transportation than actually swimming with them. So if you prefer to spend the rest of your day in your awesome resort or doing an extra activity, our "half day tour" is perfect for you. Service and safety are our top priorities. Groups will be kept small (max.10 people) in order to offer you the best service. If you’re a larger group we can handle it under special request (at least 3 days in advance). Photo and video service are optional and with extra cost. We recommend to bring some money, we are sure you will want some of them. Available daily at 07:00, 09:00, 12:00, 14:30 or 17:00. You will still have time to enjoy your vacations, and have other fun activities during the day. The pick up time is set according to the distance to your hotel. The exact time is sent to you on the booking confirmation.